Yet the frantic abolition of all distances brings no nearness; for nearness does not consist in shortness of distance. What is least remote from us in point of distance, by virtue of its picture on film or its sound on the radio, can remain far from us. The year is 1946. David Smith has received two of his largest exhibitions to date, a pair of shows that earned him wide praise and helped to secure his reputation as "the best young sculptor in the country," as Clement Greenberg then lionized him in The Nation. Each exhibition included what the New Yorker critic Robert Coates called in a review Smith's "frenzied" postwar production, and each assumed a different audience using two distinct modes of display. The exhibitions reflected back to Smith two models of what sculpture's public address could be: one was spatial and material, inciting an experience of steel sculpture in the round, while the other was photographic, in which his works' pictorial qualities were amplified and dramatized in two dimensions. In New York, the exhibition encompassed two Fifty-Seventh Street galleries-Smith's own, the Willard, and the neighboring Buchholz-to present fifty-four sculptures, along with drawings, in a way that invited critics to track Smith's career. Coates noted a "slump" during the war and a frenetic pace afterward, as the artist produced twenty sculptures in a frenzy he attributed to a "wartime obsession . . . still working its way to the surface." Greenberg observed a similar explosion of subject matter in Smith's postwar productions, although he was less impressed, noting that Smith's "phase of extravagance, disorder, and agitation is something he seems compelled to work his way through" linking the artist's "baroque vein" to "late history." How does photography shape the way we see sculpture? In David Smith in Two Dimensions, Sarah Hamill broaches this question through an in-depth consideration of the photography of American sculptor David Smith (1906–1965). Smith was a modernist known for radically shifting the terms of sculpture, a medium traditionally defined by casting, modeling, and carving. He was the first to use industrial welding as a sustained technique for large-scale sculpture, influencing a generation of minimalists to come. What is less known about Smith is his use of the camera to document his own sculptures as well as everyday objects, spaces, and bodies. His photographs of his sculptures were published in countless exhibition catalogs, journals, and newspapers, often as anonymous illustrations. Far from being neutral images, these photographs direct a pictorial encounter with spatial form and structure the public display of his work. David Smith in Two Dimensions looks at the sculptor’s adoption of unconventional backdrops, alternative vantage points, and unusual lighting effects and exposures to show how he used photography to dramatize and distance objects. This comprehensive and penetrating account also introduces Smith’s expansive archive of copy prints, slides, and negatives, many of which are seen here for the first time. 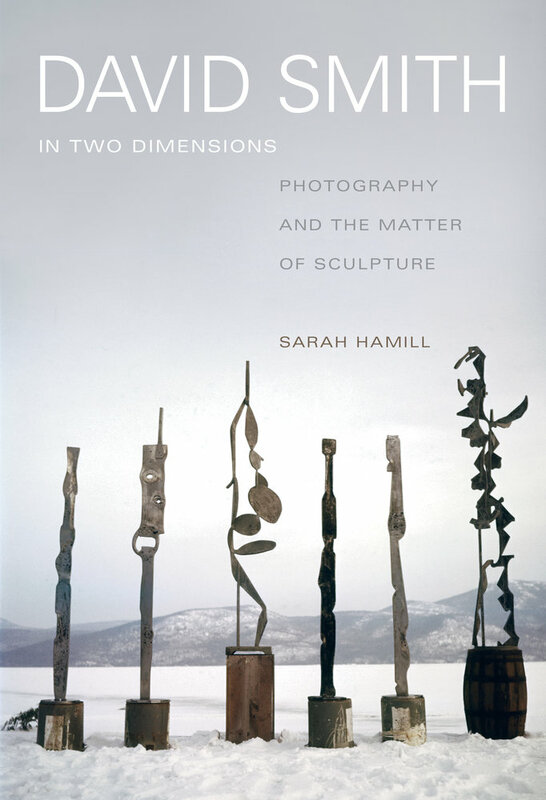 Hamill proposes a new understanding of Smith’s sculpture through photography, exploring issues that are in turn vital to discourses of modern sculpture, sculptural aesthetics, and postwar art. In Smith’s photography, we see an artist moving fluidly between media to define what a sculptural object was and how it would be encountered publicly. Sarah Hamill is Assistant Professor of Modern and Contemporary Art at Oberlin College.